The spirit of the magic lamp, who has been freed by Aladdin with his third wish. Genie has joined forces with Sora and friends to rescue Jasmine from captivity. He will attack all locked-on targets, with Showtime. Cost: 2 MP. Captive of the magic lamp. Genie must grant the lamp’s holder three wishes. He longs for freedom, but can only get it if someone uses a wish to set him free. The jolly and all-powerful spirit of the magic lamp, Genie is a millenia-old possessor of the power to grant three wishes to whoever holds the lamp. After Kingdom Hearts, Genie departs with Carpet to travel the worlds, though returns in time to inadvertently initiate battle with the Volcanic Lord and Blizzard Lord. When Sora and company return, he uses his powers to quell the sandstorm surrounding the Sandswept Ruins. After Jafar is defeated, Genie complains of how little he was asked to do, but cheers up when he is able to join the part yas a summon, aiding Sora in battle by mimicking his drive forms. He's the one, the only… Genie! 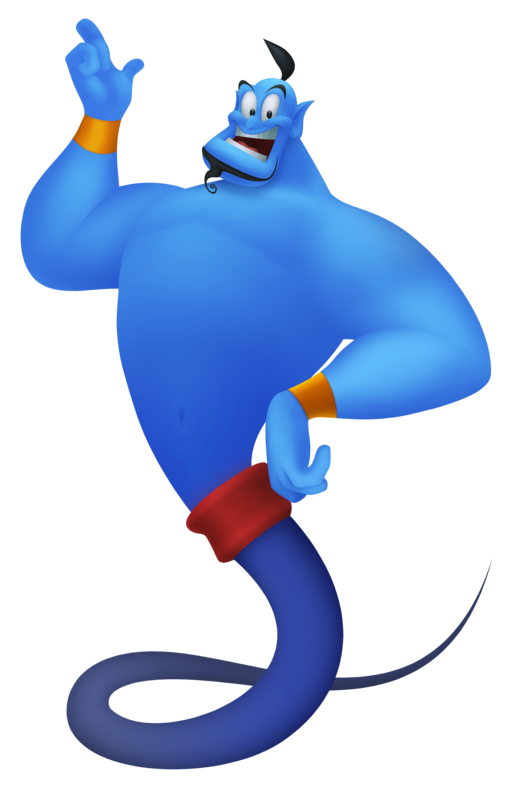 The Genie is known for his outgoing personality that matches his bright blue complexion. In Kingdom Hearts, the Genie was freed from the confines of his magic lamp thanks to one of Aladdin's wishes. During the course of Kingdom Hearts 358/2 Days, Genie has gone to travel the world with the magic carpet like he had always planned. Yet when he comes back to Agrabah for a visit, he finds out that not everything is the same as when he left.